I was so excited to find a YA fictional novel that was set in El Paso that I didn't even bother much with the synopsis beforehand - and I'm glad I read it, too, as this is such a beautiful story! As the synopsis describes, this is a novel about the growing friendship between two teenage boys who have always felt like outcasts. One of the main themes of the novel is the heritage struggle - both Aristotle and Dante come from Mexican-American families, and grew up on the border, but neither feel that they truly fit in with their cultures. Dante doesn't speak Spanish, and doesn't consider himself to be a "real Mexican." He feels alienated from both his family and his culture - part of which is because he has light skin, and the majority of his extended family doesn't speak English. But Aristotle is dark-skinned, speaks Spanish, and still feels the same alienation towards his family and his culture that Dante feels. Personally, I felt that I could really relate to Dante, because I, too, am a Hispanic El Pasoan who doesn't speak Spanish. It may not seem like a big deal, but growing up on the border I have often felt alienated because of the language barrier, especially since I, too, have family on my mother's side that I can't communicate with unless my mother acts as a translator. I especially enjoyed reading about the camaraderie between Aristotle and Dante, however. 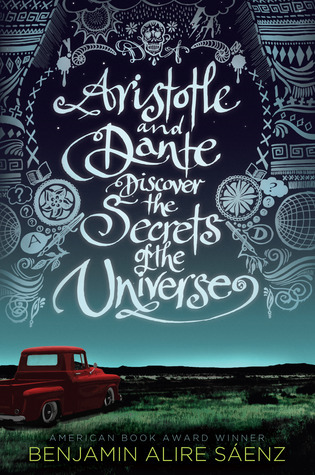 It was great to see two "outcasts" with totally different personalities (Aristotle was more quiet and reserved, while Dante could charm the hell out of complete strangers) gain so much understanding of each other. I don't want to give any spoilers, but this novel is categorized as a coming-of-age LGBT novel, so I feel I can at least say that it was also very heartwarming to read about their growing relationship, in addition to their growing friendship, without really giving anything away. I haven't read anything that was set in my hometown before, and it was a nice surprise that the first book I came across with an El Paso setting ended being so touching. This was truly a beautifully written novel and I'm looking forward to reading more from this author! This sounds like a wonderful book. How cool that it's set where you live. It's been surprisingly difficult to find fiction novels, let alone YA novels, that are set in El Paso. This was a double win for me! I'm glad to see that you really liked this one! I have sadly never read a book set where I live, so that's pretty awesome that the book had a setting that you knew. I've heard pretty fantastic things about it so I've been hoping to pick it up and read it. I'll definitely have to do that soon! Great review. :) I love your blog; I'm a new follower!